The Eastern Grey Plantain-eater, Crinifer zonurus, is a large member of the turaco family, a group of large arboreal near-passerine birds that can be found in open woodland habitats in tropical east Africa. This turaco averages 50cm in length - including their long tail. They are common, noisy and conspicuous birds, just like their relatives, the Violet Turaco , but lack their brilliant colors. The plumage is overall grey above spotted with brown. The head, erectile crest, neck and breast are brown streaked with silver. The underparts are whitish, heavily streaked with brown. Eastern Grey Plantain-eaters have a thick bright yellow bill and show a white wing bar in flight. 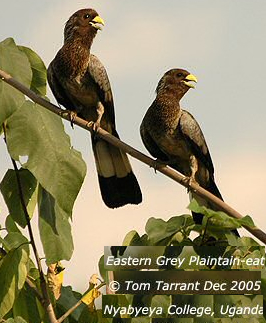 This bird is similar to the closely related Western Grey Plantain-eater. However, Eastern Grey Plantain-eater has white tail bars, and lacks the chest bars and dark wing feather shafts of its western relative. This species feeds on fruit, especially figs, and other vegetable matter.